OK, you guys might think I’m completely crazy to be in the middle of designing our house when I’m 9 months pregnant and I can’t say that I disagree with you. Ha! What can I say, I’m in extreme nesting mode! We thought about pushing the design process back until after the baby is born, but really, things aren’t going to necessarily get easier over the next year so we’re trying to get it done before this little guy arrives! And I haven’t told you guys a ton about my designer Veronica, so I’m going to gush about her on here for minute! First off, let me start by saying, everyone meet Veronica Valencia! Veronica Valencia, meet everyone! 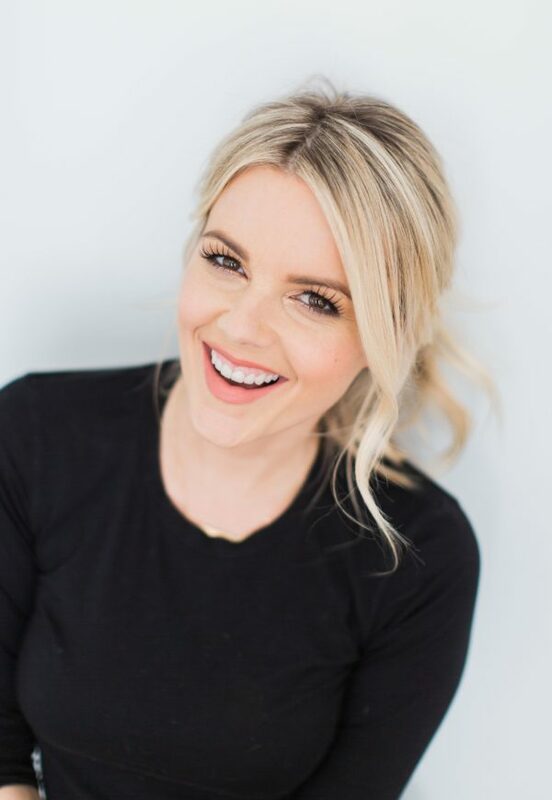 (Follow her on Insta HERE – she’ll be posting a bunch of fun stuff about our home soon!) Veronica is an absolute rock star designer that has worked with so many amazing clients and even worked as a designer on Extreme Home Makeover Home Edition! 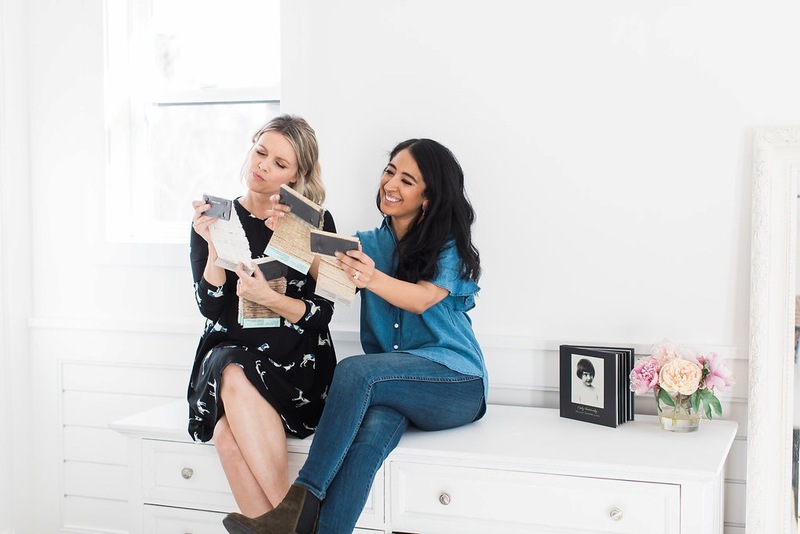 My girl, and fellow Bachelorette, Jillian Harris introduced me to Veronica about a year ago when we began our search for a new home. 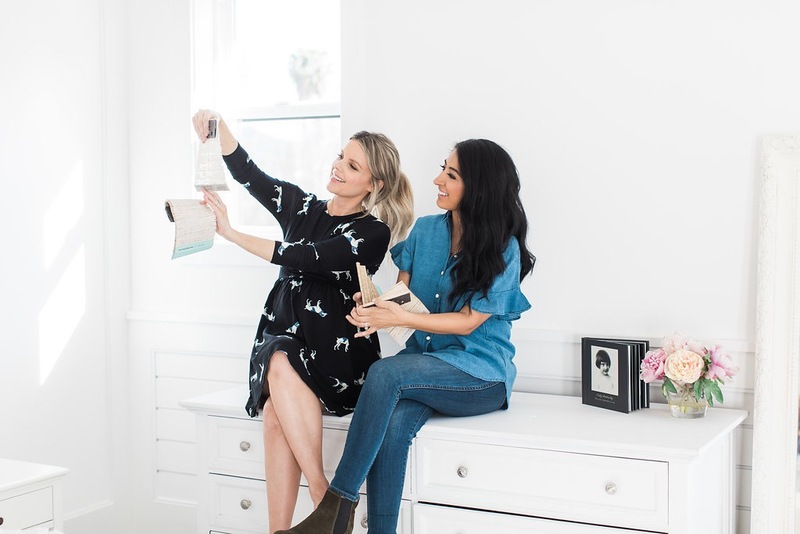 Veronica has been so awesome since day one, and based on all the mood boards she created for our home, I’m so ridiculously excited to share the final reveal with you guys once it’s all complete! And by the way, did you see the nursery she designed for us in Us Weekly? I’ll link it HERE so you guys can see it! I’m so obsessed with it and honestly just sit in that room sometimes because I’m in love with it so much. I’ll sit there and think about our little boy and how he’s going to grow up in that room. There are a few photos on Us Weekly’s site (and in their mag this week!) but I’ll have a full blog post on it sometime soon so you guys can see even more details! Anyway, I’m writing today’s blog post because we want your opinion on helping us choose blinds for the master bedroom! We are using Veronica’s line of blinds from Select Blinds! As soon as she showed them to me I knew that we absolutely had to use them because they’re so gorgeous! Check out her entire line on Select Blinds HERE. The material and texture of the blinds really brings a warmth to our home that I feel it desperately needed. Our house has really high ceilings, which is nice but also can make the house feel a little cold. Adding these blinds downstairs made such a difference! So I’m really excited to get them in the master bedroom. Like I just mentioned, we already chose the colors for the rest of the house. On the main floor we mostly did the Veronica Valencia Oceania Woven Wood Shades in a beautiful neutral color called Island Earth. At first I wanted to go with all white downstairs, but Veronica suggested adding in some neutral color and I’m so glad that she did! All of the walls in the house are white and a lot of the furniture is going to be white as well (or light in color). So the neutral blinds are a perfect contrast! Thank goodness I have a designer or my WHOLE house would be white. Ha! And I know what you’re thinking, we’re crazy for having a mostly white house with children and a dog. But don’t worry, we added a lot of pops of color and wood-tones that you’ll see once we finish the house and share it with all of you! And yes I’m fully aware I’ll be chasing my children around with a broom and towel trying to clean everything up for the next 10 years. Ha! OK, back to the blinds, we chose the Veronica Valenica Coastal Woven Wood Shades in a really pretty grey called Tahitian Surf for the nursery that you can see in the Us Weekly photos. And for my office on the main floor, we went with the Veronica Valencia Island Woven Wood Shades in a gorgeous white color – Austral Island. Veronica suggested cordless shades in the Nursery and Molly’s room, because it is safe and highly recommended for kids and pets – love that! I didn’t even know! Which brings us to the master bedroom. The master bedroom is meant to be mine and Kevin’s sanctuary. We don’t plan on having the kids run amok in there and I want it to be a beautiful place for me and Kevin to unwind at the end of the day. This is the one space in the house that I want to be as light and bright as possible. Some people like their bedrooms to be dark so they can sleep in later. But Kevin and I go to bed super early and wake up even before the sun is up, so that’s not really an issue for us. So this is where you guys come in! Veronica and I are torn between the 3 colors below. Which one do you think we should go with? 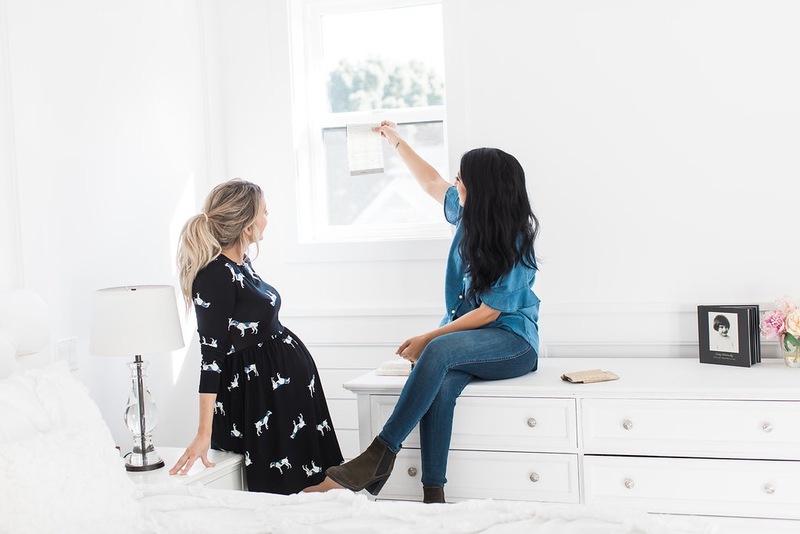 We are going back and forth on whether we should keep it fresh with the Austral Island (white), go with the Bora Bora (similar to the grey we used in the nursery) or even the light natural woven Winward Island (that we have in the majority of the downstairs in our home). Tell us what you guys think in the comment below!!! 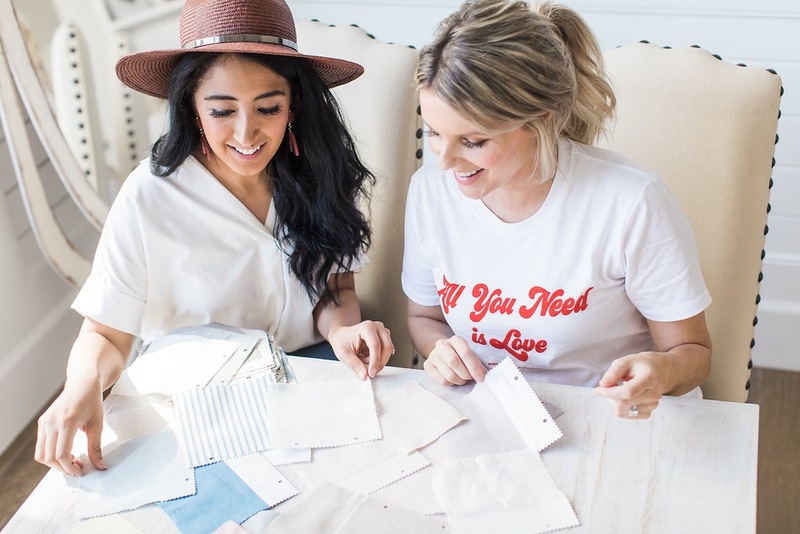 Veronica and I are SO excited to have you guys be part of the design process with us! We haven’t choose for the Master yet! They are all beautiful!!! I love an all white room though! It is so calming and beautiful! Especially with natural light! I say the Austral Island (white). Either way you go it will be beautiful! Can you show us a bigger swatch of the three choices? My Vote: The white one! Aren’t they soooo pretty?! They look dreamy in the nursery! I love the bora bora 😉 and i love you and your little family!! Hi Ali, I think you should go with the Bora Bora (grey) in the master bedroom. My second choice would be the Austral Island (white) but that would be too much white, you need a little color. Love following you, have been since the beginning. No such thing as too white white in home decor Peggy! Ha! Just kidding 😉 I just love a white and bright home! They are from Wayfair 🙂 I LOVE them! It all would depend on the color white..I myself like different shades of doing white on white. Love your home! Do you know what type of flooring is throughout the home? I don’t know! It was here when we moved in. I need to try to find out because so many people are asking me! Bora Bora. It’s a beautiful color!!! Bora Bora seems to be a favorite! It really is beautiful, but I love the Austral Island (aka white) too! I say go with the ones that match the majority of the others so from the outside it looks clean and uniform! I think they are all white on the back so it matches outside 🙂 Which is nice! I know you said you get up early, but I would still out with a room-darkening blind in the bedroom. You could need a little dark in the bedroom at times! I use eye masks to nap during the day. I just love the look of something the light can come through to make the bedroom light and bright. But I could back either with black out material. Or do blackout drapes to go with them. We are going to do drapes too! We love the blinds so we are sticking with blinds! Love the Austral Island for the master! Second pick would be Bora Bora! We’re just building a home and have no idea what to do with blinds. Do you love these ones? do they keep the light out well? Or are they more for just shade? The ones we have in the nursery and Molly’s room are blackout and we love them! Bora Bora or Windward Island!!! The natural color would be a nice contrast (and sounds like would match the rest of your house) but I’m a sucker for grays! Our whole house has some sort of gray tone in every room!! Can’t wait to see the final product!! I think we have narrowed it down to those two colors as well! But those are both SO good that it’s hard to pick just one! I think I might agree with you. We used some color blinds in the rest of the house, but I love a white bedroom! That said, the Bora Bora is so subtle so it could be great! Ahhhhhh it’s so hard to decide! Isn’t it so gorgeous in the nursery?! Austral Island! LOVE white! So classy and clean :). You can’t go wrong with any of the options though! Happy nesting! I think both the white and grey colors would be fantastic and calming! The grey, same as nursery would be my choice! Warm, cozy and little darker for sleeping. I love the Bora Bora shades! You’re house is going to be beautiful. Excited for you and your adorable family! White! Keep the flow….any color breaks that up. You can never have too much white! I work for an interior designer, so I would go with the white that matches the window frames on the window without seeing the rest of the master bedroom. You can always put a lining behind those woven shades and can even do a black out if necessary but I would just do a light filtering liner if it needs one. That being said, it depends on where they are in the house as far as is it in front where you need to coordinate with other windows so everything looks uniform? Or is it in the side or back that is not so visible. I looove the austral island (white); sooo pretty. If I could, I would also have an all White House, im still obsessed with your kitchen, ha! I love the austral white! I love the Bora Bora! She many options for pops of color to add in with white and grey. Navy, yellow, orange, green… so many fun combos! Does the austral island one have texture/gray-ish lines in them (it’s hard to tell in the photo)? I really like that one! I’m also a sucker for grays so bora bora would be a great choice and like how light that one is. Good luck!! P.s. I love your dog dress!! They’re all gorgeous and I don’t think there is a wrong choice – I would say the Austral Island only to mix it up since you have Bora Bora in the nursery and the Winward Island on your main floor! Might as well have all three beautiful options in different rooms of your house! Can’t wait to see more of your house, the little pieces I see in insta stories looks so gorgeous. I love the Bora Bora!! Can’t wait to see what you end up choosing!! I say go with the natural woven. I love that look and it gives such a texture to the room. I have them in my house and absolutely love them! I’m definitely thinking the grey! It’s light and gives that hint of color to a room without going way overboard. I cannot wait to see the house and I love watching the process! I like the Bora Bora!! Adds a nice color and since you have done white in all the downstairs. Bora Bora is beautiful and I think has a serene feel to it! I love the Bora Bora shades!! I’m excited to see the end result! The Bora Bora is beautiful, cslming color. I wish this had been posted a month ago before I bought my blinds!! I would do the white especially if you want to keep it bright in there! My vote is for the Winword Island, but a of them will work so I see your dilemma! Can’t wait to see it all! I think the white is beautiful! The nursery is gorgeous by the way, can’t wait to see pictures when the little man arrives! I just love following you on Instagram, Molly brings a smile to my face every day! Thanks for letting us all be a part of your journey! Austral Island in the master-calm and peaceful and pretty! White white white! I don’t think you can ever have too much white! So clean, crisp, and timeless! All are beautiful though! All are very pretty, but I would choose the Austral Island for sure!! Very pretty shade. Good luck!! I say the gray! White would be second choice! Love love the bora bora and think it would be perfect with the light colored walls. Great contrast! I’m sure whatever you decide will be perfect! What color bedding are you using? If you’re doing white then I would go with the grey blinds. Are you using any type of curtains? Love all of them but I’d go with Bora Bora!! I like the first choice! It’s so pretty! Love the gray one! I love everything white and light gray myself. Your house looks beautiful so far and love your little boy’s room. Nothing like a mother’s bond with her little boy. (I have 2 myself, one being Molly’s age) So exciting you get to experience both boy and girl! I love the white or gray! Maybe white since you will do drapes someday too. Your home is beautiful! I can’t wait to see the house tour once it is done! Congrats on your baby boy! Soon!!! You have a beautiful family! Molly is so cute! Love the softness and color of Bora Bora!! I would love to see Molly’s room now that you moved!! Did you keep it close to the same?! Bora Bora! So pretty and warm! I was just looking at these today! We just bought our first house and I need blinds, in my sons room though he’s got 3 windows I have to cover and he is so sensitive to any light leaking through. How good are these at room darkening?!? Bora Bora! It’s looks so pretty and love the color! Bora Bora! Love the bit of grey still pops and is bright! I’d pick bora bora for your master. Hope we’ve help the decision easier for you! hi, I don’t see the winward island that you say is in the majority of your downstairs? I see the Oceania? Im confused. Where is the link for the Winward Island. I see that you have the grey Bora Bora and then the Austral white, but what is the exact one that you have downstairs in most of your home (you reference Winward Island one place and then Oceania (Island earth in another). Thanks for clarification. Is it Bora Bora driftwood? Under those shades there are a number of colors called Bora Bora. I love the pictures of the nursery….would love to know the exact color. Thank you! I love the bora bora ! 30 more days until the blessed event! Hi there, I know it’s unrelated but where did you get that alphabet puzzle book Molly was reading? subtly) so I am leaning towards the Bora Bora. I still think it is light,bright, airy, etc. On the other hand, Austral Island is so pretty too… Ahhh sucha hard choice. Either choice would be beautiful. I guess it depends if you want all white everything or if you want to break it up and mix in another neutral. Is there a specific white paint color you like ? There’s so many variations of white! Can you tell me where the chandelier in the master is from? It’s gorgeous!